add a touch of feline beauty to your garden! Cat garden statues and cat-inspired yard art make unique, out-of-the-ordinary, whimsical cat lover gifts, especially if you and your cat-loving friends love both cats and gardens. They will love the gift of a cat-themed garden statue. 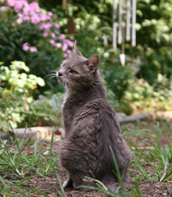 These cats will not bother the birds and will add feline beauty and elegance to any garden. Below you will find a list of suggestions to help you select a unique piece of cat yard art for the garden. Garden statues come in different sizes and materials. You can go with the traditional concrete statues or you can try other materials such as: terracotta, stone, marble, granite, iron, bronze and wire. You can also find statues made of wood and fiberglass. But before making your selection, take into account the durability of the cat garden statue you want. Remember that pieces of garden art need to be strong and sturdy to withstand the weather. Another thing to remember when choosing a cat garden statue is style. Do you want a contemporary piece such as a wire sculpture or would you prefer a more traditional, classic piece? Having decided on a particular design will narrow your search. There is a wide variety of styles: Among the pieces I’ve seen online are abstract pieces, funky sculptures made of metal, and whimsical planters with feline motifs. These pieces can be used indoors as well! Even though cat yard art is designed to decorate the garden, a piece of yard art can also be used as an indoor piece of decoration. You can really get creative and get a piece that enhances your home décor. A garden statue can also be used as a focal point. Those of us who live in apartments can take advantage of cat garden statues or other pieces of yard art to decorate our indoor spaces. Garden statues can be used in the kitchen, in the dining room, even in the living room. These pieces can also serve multiple functions in addition to beautifying your place. For example, big pieces can be used as doorstops and bookends. Smaller pieces can be used as paperweights. It all depends on the design of the piece, your personal style and if that particular piece matches your home décor. Again, you can find wonderful pieces in materials as varied as cement, metal and clay. They also come in different styles, sizes and colors. Below you will find additional ideas to help you select unique decorative items of cat-themed yard art. You can find a wide selection of cat garden statues and sculptures that go from the simple to the elaborate, and from the elegant to the whimsical. These amazing pieces come in different sizes and colors. Cat-themed statues also come in different materials such as hand-carved stone, concrete, terracotta and metal. 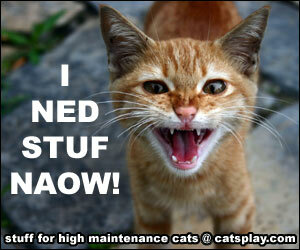 Visit our cat statues page for more information. Planters can be used outdoors as well as indoors. This is one of my favorite elements of home décor. Planters used indoors allow you to bring the outdoors in. If you live in an apartment and/or don't have a yard, then you can create an interior garden with the help of a few planters. Bird feeders provide a wonderful touch to any garden. You can find fun and whimsical bird feeders. Besides, if you have an indoor cat, a bird feeder will give kitty the chance to enjoy all the action without disturbing the birds! Just place the bird feeder near a window. Do make sure the window screen is properly secured. Always a nice touch to any garden, fountains will certainly add a touch of magic and beauty! Luckily, they come in different sizes and styles. Also, there are small fountains especially designed to be used indoors. Again, this is a fantastic idea if you don't have a yard. As you can see, there are many alternatives available to you. I hope you find the perfect garden cat for your garden.